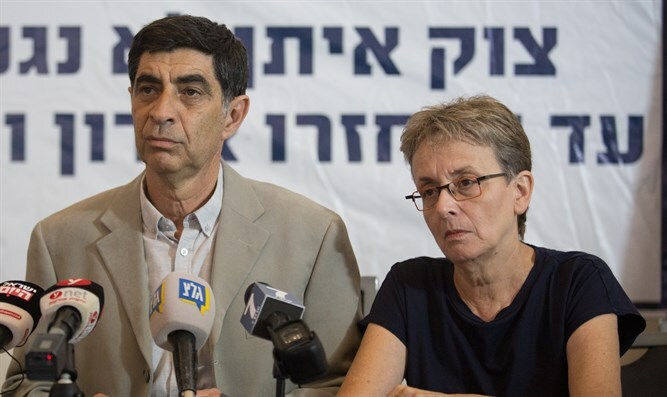 Parents of abducted soldier Hadar Goldin say government doing nothing to bring missing soldiers home. Five months after their last meeting, the parents of Lieutenant Hadar Goldin, who was killed during a humanitarian ceasefire by Hamas terrorists in 2014, met again with Prime Minister Binyamin Netanyahu. The meeting was also attended by Military Secretary Brig. Gen. Avi Blut, Coordinator of POWs and MIAs Yaron Bloom, and Yuval Rotem, Director General of the Ministry of Foreign Affairs. Simcha and Leah Goldin said they were disappointed with the meeting. "The prime minister continues to yield to the dictates of Hamas and refuses to set a clear condition to Hamas that the rehabilitation of Gaza will take place only after the boys' return." "Now, four years after the abduction, Netanyahu is not demanding the sons' return and again agrees to a ceasefire that also Hamas can choose when to break and when to abduct more soldiers. "Unfortunately aside from general statements and hollow phrases, which are meant for public relations, Netanyahu has not yet done anything significant to bring back the boys," the parents claimed. "We left the meeting today with a strong feeling that behind the Prime Minister's statements that he and his government are doing everything possible to restore Hadar, there is a sad reality that nothing has been done," the parents added.